The interprofessional town hall held in late October. In late October, two student facilitators from the Trotter Multicultural Center led exercises that challenged students to break through stereotypes of their various professions and envision a change in culture. The discussion was part of the second annual U-M interprofessional town hall. The town hall’s goal was to learn how to better work together in collaborative practice that can improve patient outcomes and population health. “I heard the word ‘team’ a lot,” said facilitator Matoaka Kipp, a social work master’s student. 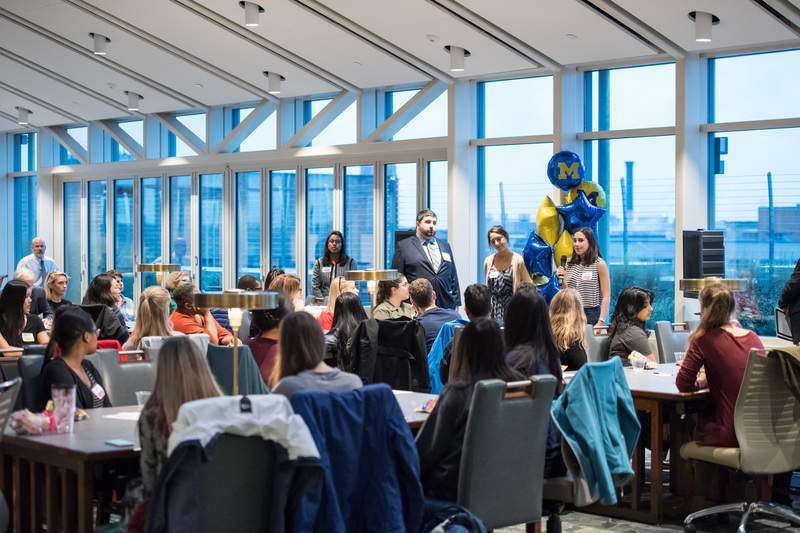 Kipp wandered from table to table during the group discussions carried on by approximately 80 students, which included representation from all U-M’s health science schools. A dozen faculty members attended this year’s town hall, some of whom had led discussion groups at last year’s event. Several faculty took the opportunity to pitch ideas to students, such as how to take interprofessionalism into global health settings. Others sought suggestions on how to further build momentum on campus as U-M aims to cement its status as a national leader in interprofessional education.